Modular homes were once seen as a thing of the past but have become a solution to the modern-day housing crisis. Modular homes aren’t that expensive, with the average price between the regions of £100,000-£250,000, although some can be built as cheap as £30,000. But what aspects make modular a more affordable investment for the construction process? Modular homes are quicker to manufacture than on-site construction which can make many aspects of the construction process cheaper. It is possible to build a standard modular property in 1-2 weeks, allowing a further 2-4 weeks for the home to be in a livable condition. As the homes are built within factories, there are fewer interruptions from factors like adverse weather conditions than on-site development. Manufacturing of the house can be built at the same time in the factory, as the foundations in its desired location. As the construction occurs in a controlled environment there is less room for error. With design programs like CAD (Computer Aided Design) allowing the customer access to the plans, it’s possible to choose cheaper materials without compromising the overall quality. Materials for the exterior like cement, wood, and concrete can be used to their specifications, which will save money in construction costs. Materials are safer in factory settings, as they are less prone to mould and deterioration from strong weather conditions. However, it is worth noting that the cheaper price only relates to the structure of the property. Features such as electricity, plumbing, and ductwork are not included, so you will need to service this for yourself. This will, of course, add to the overall cost. With the home taking less time to build, it will require less labour as a result. This allows contractors more control over the team, as workers will be in one place and they can assess how many colleagues and hours are needed to complete the job. This an effective solution to reduce the cost during the construction process. He finishes by stating that most building sites in fact, “operate on a sub-contractor basis, i.e. a lot of the workers are just brought in for that job and then laid off … [but] we’re running a business.” This allows you to use your chosen staff for that project, and so it is cheaper in the long term. Therefore, if you are a contractor who is looking to save money, it is worth paying for a consultation with businesses for a deeper understanding of supply chains to get the best deal for the project. One of the most expensive aspects of modular homes is the price of moving the structure from the factory to its destination. Before the construction process, you will need to consider the types of materials you will need to use for the transit process, as this can make it more cost effective. With regards to transportation, the maximum vehicle weight is 4.4 tonnes(truck, fuel, and load.) The maximum length for an individual truck is 12 metres, whilst the width for all vehicles cannot surpass 2.55 metres. Practical for moving, but unsuccessful in terms of weatherproofing, durability and heat retention. Energy efficient and weatherproof, but exorbitant costs for dismantling. A modern solution is lightweight tiles, which weigh up to 7 times lighter than traditional roof tiles. With a higher durability than materials such as slate, they can protect the house from strong winds and other severe weather conditions. They are very robust, which means they are more likely to stay together during the transit process. However, it is also possible to dismantle the tiles before the journey if you need to readjust the height, length or width due to motorway restrictions. Once they reach their destination, they can be easily fit together, saving you both time and money. 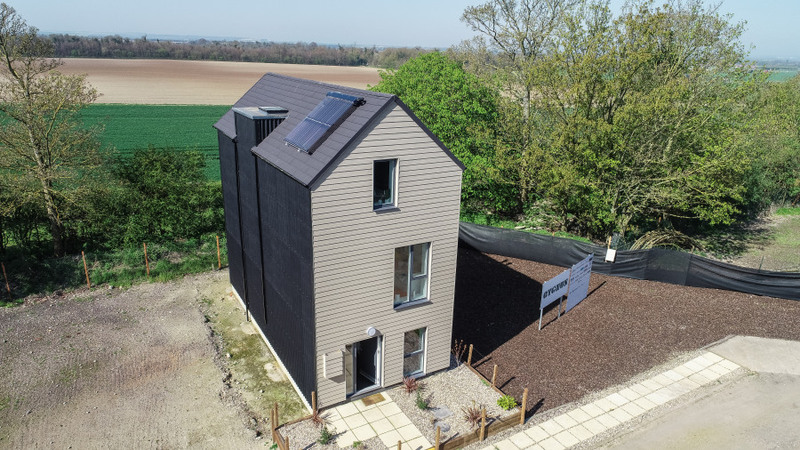 The modular home can also be transported more compactly, and cheaper, whilst high performing for energy efficiency and weatherproofing. With quicker timescales and a cheaper cost on materials, modular homes are quickly becoming a popular option. Specialist roofing companies such as Metrotile supply lightweight steel tiles which perfectly complements prefabricated houses. As a cost-effective solution during the transit process, lightweight tiles also provide a modern finish to the aesthetic of your property. Metrotile is Europe’s number 1 lightweight steel roofingsystem. Our lightweight steel tiles are extremely durable, with a forty-year guarantee and deliverable within 24 hours. For more information, fill out a contact form or call us on 01249 658 514.